After you have had a wonderful Irish meal of Irish Stew or Corned Beef and Cabbage for St. Patrick's Day -- or any day -- why not have an easy to make and very flavorful Irish dessert? The solution would be what is called a Trifle. This dessert, popular in England and in Ireland, is a mixture of many things which can change from cook to cook. It is usually made from a pudding or custard, with soft cookies or pieces of cake added, which are sometimes soaked in liquor such as wine or rum. Include some chocolate or fresh fruit, as you like. Whipped cream may be used too. Sometimes small candies can be added. The whole concoction is mixed in a clear bowl so all the colors can be seen. If you layer it, it makes a very nice presentation. 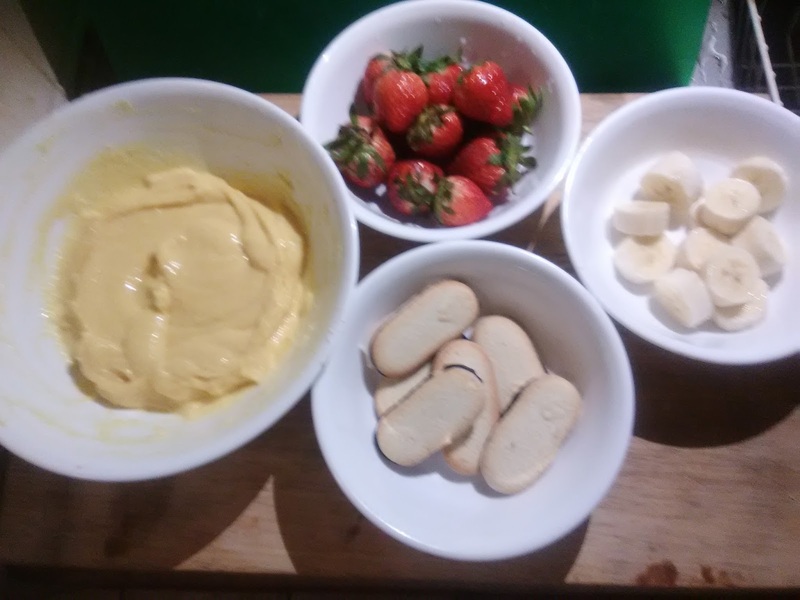 Pudding, cookies, and fresh fruit. A bit of research shows us that this dessert first came into being in the 1500s probably in England, but different versions appeared elsewhere in Europe. Over time various things were added like jelly or gelatin. But today there are really endless variations of the dish. 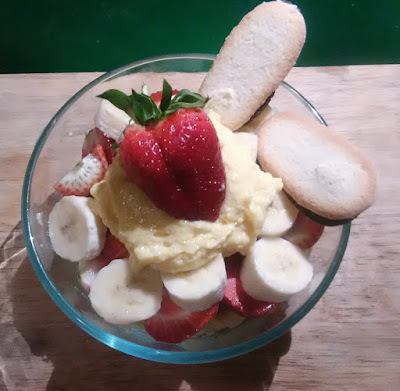 The best way to make Trifle is to find the fruits and pastries you like the best and just mix them up, adding what you like and see what happens. So, it is a great dish for experimentation. Bord Bia, the Irish government's food board or agency, gives its recipe and a little discussion here. Its trifle contains a fortified wine, nuts, cream, and many other fine things. I made my own simple dish with just four ingredients. I never made Trifle before, so I decided to keep it simple. I used sliced fresh banana, strawberries, a vanilla pudding, and soft cookies. soft cookies, sliced banana, strawberries. Simply spoon the dish into individual bowls and serve with coffee, tea, or wine for a nice dessert. 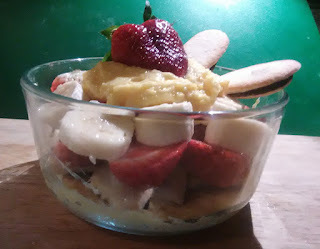 Sources and Further reading: Bord Bia on Trifle; Wikipedia article on Trifle. Wouldn't the most authentic version of coddle be ones that are made with fruits that are actually produced in Ireland? I see that Bord Bia provides a list of fruits produced in Ireland.